1992 Chevy P30 Grumman Step Van. In great overall condition, 9 out of 10. 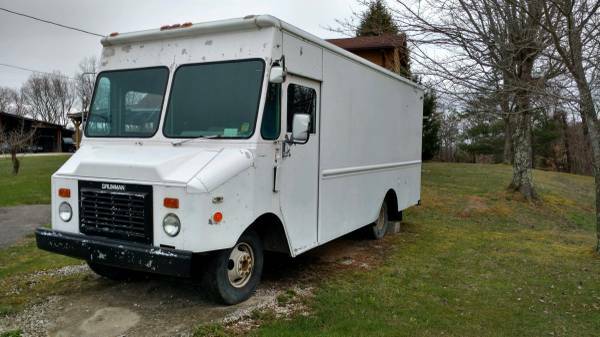 Runs and drives well, had the intention of making a food truck but have lost interest. Make it whatever your needs are. Interior: 15 foot 7 inches from Driver’s seat to rear door. 7 foot 3 inches width. Overall length from bumper to bumper is 23 feet. 10000 GVWR Van body in great condition, no leaks, no rust. Inside has been stripped, ready for any need. Replacement motor installed by previous owner. Solid motor and transmission. 350 hp 4 Barrell carb. Automatic. Brakes good. New battery installed. Good/clear title. Replacement mirrors included not put on yet. Jump seat. Minor issues: Fuel gauge not working. Side glass in one door cracked. Will need front tires. Missing passenger wiper arm and blade. Some clearance lights not working. $6000 negotiable, will not last long. Motivated to sell. Make offer and it could be yours. Vehicle located 70 miles east of Lexington, in Menifee County.